The post is a technical review of the main electronic game stocks, Activision, Electronic Arts, and Take Two Interactive. The technical posture of each chart is given along with their key trading levels and potential long and short trade entry locations. High-flying game stocks $ATVI, $EA and $TTWO got taken to the woodshed in Q4 each losing between 30-50% off their highs. Since the year end, all the stocks have been consolidating in narrow ranges and to my eye are poised to make directional moves. 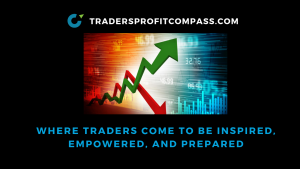 In the post, I will explore the technical posture of each stock and give you the key levels to alarm on each stock so you’ll be ready to take advantage of the directional moves that will eventually happen. $ATVI, like many many stocks took a severe beating in Q4. It was quickly cut in half. Now the stock has been consolidating within a narrow range between $45 and $48. Interesting that the stock has seen zero bounce with the market in January. That is bearish in and of itself. To my eye, this looks like a classic bear flag. The impulsive move down being the flagpole ( purple ) and now the consolidation flag in recent months. The measured move for this formation is way down at $27.50. That target seems far-fetched until you realize the stock was there 36 months ago. I’d really only envision this move if there was a broad market sell off, but the possibility remains. Notice also that the RSI & PPO indicators are in bearish modes ( upper panels ) as is the ADX in the lower panel. This stock has heavy technical damage that will take a long time to repair. 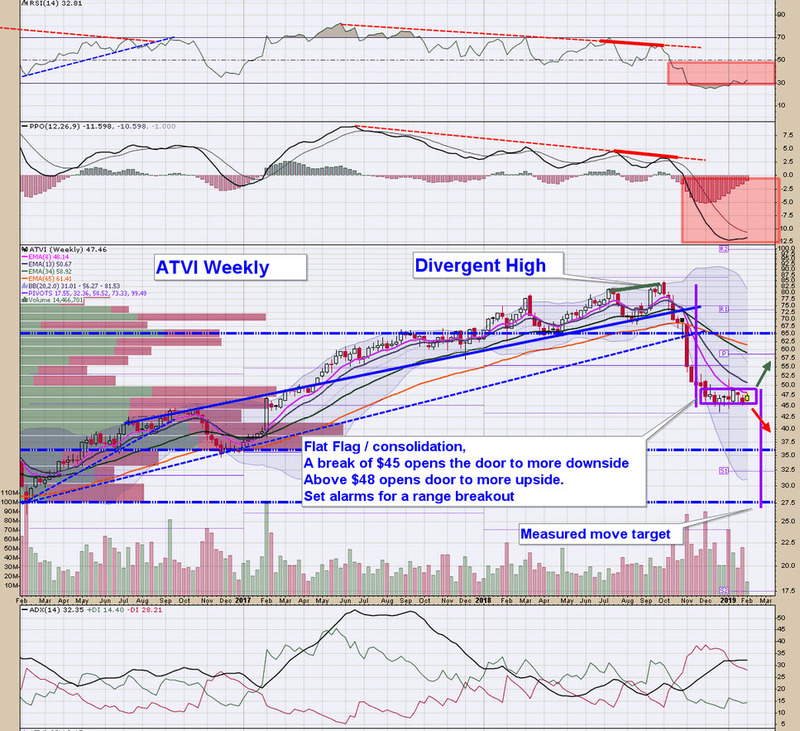 ATVI has the most bearish set up of the group. Set yourself some alarms at $45 and $48. With a break of $45, get short with a tight stop just north of $45. Although my bias is for lower prices, if the market stays strong, its not outside the possibility for a topside breakout. Alarm $48 for this possibility. If price moves beyond $48 get long and set yourself a stop. A sustained move above $48 would foil the bear flag measured move set up. This stock also got cut in half going from $150 to $75 between July and December 2018. Unlike $ATVI, $EA got a nice pop in January and has moved outside the persistent downtrend formed in the second half of the year. That is a bullish development. The RSI and PPO have also moved into bullish modes in the top panels on the daily chart. Price has been consolidating between $87.50 and $92.50. To my eye, this one sets up as a bull flag. A topside breakout from the consolidation points to $102 as a target. If you’re already long, stay long against $87.50. I For those with no position, alarm $92.50 and $87.50 which defines the consolidation range. If the market stays strong, I’d favor an eventual topside breakout. That said, I would not hesitate to set up a short with a break below $87.50. This could easily make a move to re-test the prior lows if the market softens. Regardless, the well-defined trading range is the key to the trade. There are clearly defined levels to shoot against with a clear place to set a nearby stop if the move turns out to be a head fake. 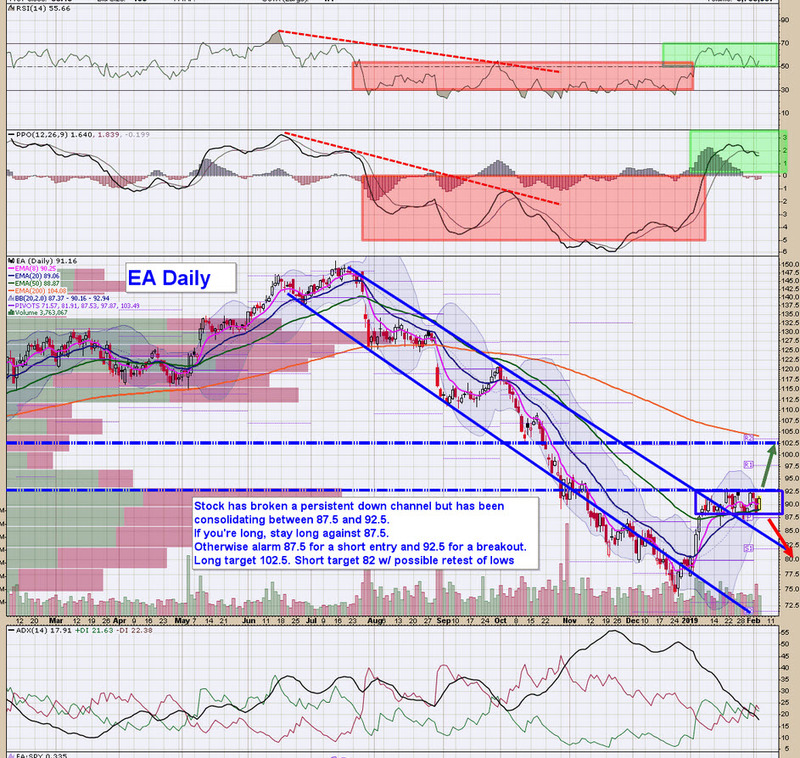 Just out as I write this, looks like $EA missed on their earnings. Lets see how it plays out for both this stock and the group. My quick take is that if price stays below $87.50 get short. The Q4 slide knocked TTWO’s stock down from 140 to 100 but from there its held the line and has traded within a fairly tight $10 range from $100 to $110. Here too, the RSI, PPO, and ADX indicators are in their bearish regimes. That said, RSI and PPO have initiated a slow curl upwards. Maybe the tide is turning positive. If you’re already long, stay long against $100. No reason to sell if price holds $100. For others I think the well-defined trading range gives us a nice set up for a possible breakout or break down. Above $110, I like this long with a first target of $120 and T2 as $130. On a downside break of $100, I’d wait to initiate a short until a break of $95 where there is some support. Underneath $95 is a lot of thin air due to the rapid advance from 2016. $95 is also a place for bulls to make note of. If $95 were to hold, it would a great entry for someone interested in getting long. 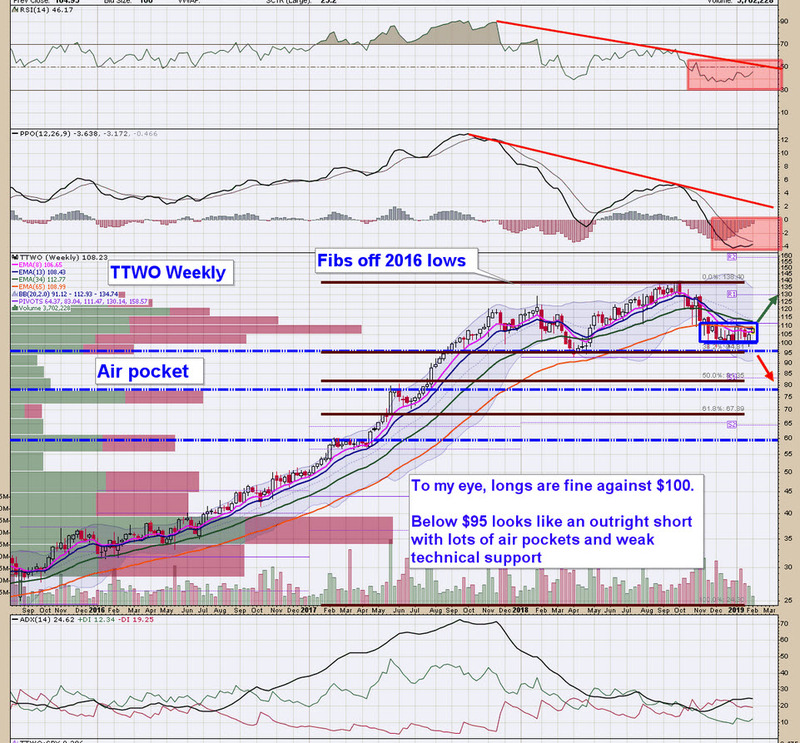 Alarm $110 for a box break higher; then alarm $95 for a potential long or short depending if that level holds. It is so interesting to me that all 3 stocks in the group are consolidating in tight ranges. Would not surprise me in the least to have all 3 move within days of one another whenever a catalyst presents itself. In my experience these range breakout / breakdown trades are nice set ups. The entry levels are well-defined and stops can be easily located nearby. It should be clear if price proves you wrong. Keep in mind, no trade set up works 100% of the time. Keep your position size within reason and have stops in place in case of a reversal. Remember, set your alarms now so you All are poised to make a directional move. We’ve been very fortunate over the past 10 -12 weeks. Our team has been winning, not perfect, but winning. I’d like to think you’d benefit from the work. You’ll get a copy of my Daily Profit Compass, Weekend Profit Navigator, and other actionable content delivered directly to your mailbox each morning.